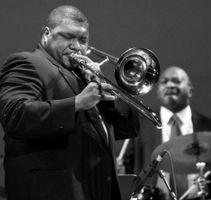 Wycliffe Gordon’s award-winning talent on trombone, slide trumpet, and other brass instruments is simply astonishing. A former member of the Jazz at Lincoln Center Orchestra and the Wynton Marsalis Septet, Gordon has built an impressive career touring the world performing hard-swinging, straight-ahead jazz. Winning Best Trombone in Downbeat’s Critics’ Poll and Trombonist of the Year from the Jazz Journalists Association in 2016, there’s no doubt that his exceptional technique and his signature sound have solidified his place in musical history.